Although I'm baking a bit healthier these days, it doesn't mean that I can't bake treats like these Birthday Cake Bars for my regular baking club! 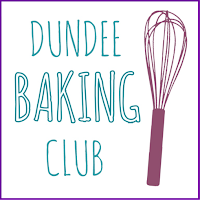 The Dundee Baking Club has been going for a good few months now. We were originally the Dundee branch of the Clandestine Cake Club where we could only make cakes. 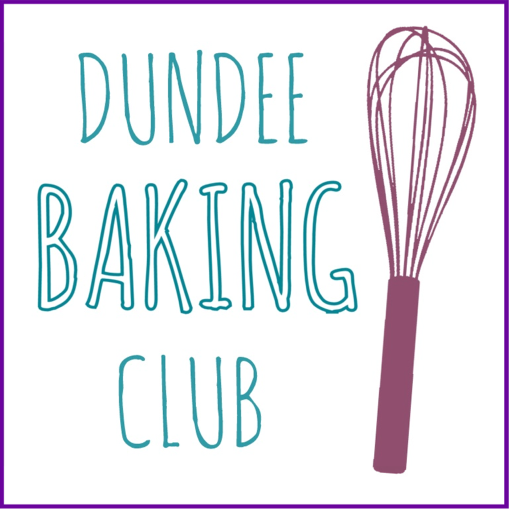 We decided to ‘go it alone’ and started the Dundee Baking Club instead. This allowed us to bake whatever we wanted – cakes, cupakes, traybakes, sweet, savoury – anything baked as long as it fitted our theme. Co-host Becca decided the theme this time, it was her birthday the day before, so she chose birthday as the theme. As ever, it was great fun to see (and taste) how everyone interpreted the theme. We had our first savoury bake (yay!) – Jackie made delicious sausage rolls. These were the perfect entrée into the sweet eats on offer also. Becca made a chocolate condensed milk cake which looked fudgy and gooey. 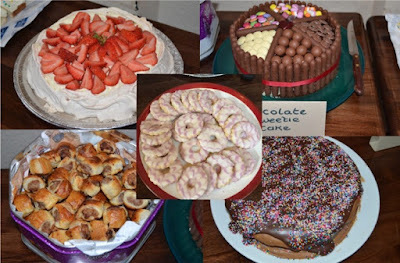 We also had party rings made by Catriona, Jane made a ‘sweetie’ cake adorned with various sweets, there was a strawberry pavlova, another chocolaty cake, a popcorn cake and I made birthday cake bars. We had our quiz and everyone tucked into the treats as we sat and pondered our questions. A great night was had by everyone. My treats, the birthday cake bars are really a big sheet cake cut into smaller bite size bars with buttercream on top of them. To make them into birthday cake bars, they have added sprinkles which are dotted throughout the cake part of the bar. I also covered the buttercream on top of the bars with more sprinkles. Due to not enough of one kind, I used three different types of sprinkle. Two in the cake batter and one kind on top. To get a whiter than white buttercream I used goats butter which is paler in colour and clear vanilla extract. The whiteness really stands out against the colour of the sprinkles. But if you can't get hold of clear vanilla or don't want to use goat's butter, regular will of course do. I also, added aside from lots of vanilla to the cake batter, a little almond extract which gives the birthday cake flavour. You may know this sprinkle infused treat as funfetti, but whatever you call it, it’s perfect for birthdays or anytime! Line a 9”x13” pan with foil and preheat the oven to 180C (160C fan).Melt the butter in a saucepan and allow to cool slightly.Beat in the sugar.Add the eggs one at a time and beat in, then add the extracts and stir to combine.Sift in the flour and salt and stir through.Add the sprinkles and stir these through then transfer the batter to the prepared pan.Bake in the oven for 20 to 25 minutes or until edges have browned slightly and a toothpick comes out clean from the centre.Allow to cool completely in the pan.Make the buttercream by beating the goats butter, clear vanilla and icing sugar together. Add the milk and beat this through.Spread this all over the top of the cake when cool, still in the pan.Add more sprinkles then refrigerate to let the buttercream firm up.Cut into bars and keep refrigerated if waiting to enjoy these at a later date. Prep time: 25 mins Cook time: 25 mins Total time: 50 mins Yield: 24 bars approx. I am entering this bright rainbow infused treat into this month's Treat Petite as I think it's 'Fit for a Queen' what with Gay Pride this month. The original recipe states that these are bars and not a big cake, so it fits into Treat Petite (honest!). That goats butter really is SO white - I must remember that, looks fab! I think YOU dropped me that hint lol! I love that you've created your own baking club without any rules! Much better in my opinion than just cakes. Fab tip for the white icing too, will look out for goats butter! The bars look so fun and colourful! I know, we are such rebels! I love how the sprinkles have kept their colour in the sponge. Perfect for a birthday - even better for Gay Pride! The sprinkles are mostly American ones - they don't care about E numbers there!! If I had one or two of these on my birthday I'd be a happy man. Dundee should be very proud of its baking club.